Eat all vegetables except Potatoes on GM diet day 2 Indian Version. Recipe is to boil all vegetables for soup. 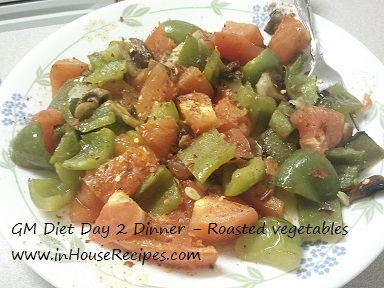 Saute or roast veggies to eat as salad. GM Diet Day 1 was well spent on all fruits and now I am getting ready for GM diet day 2. Last night’s headache has vanished after a good 9 hour sleep. My wife is cooking vegetable soup to start my day. 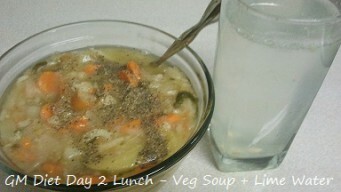 1 Potato, 1 Tomato, 1/4 sliced Cabbage, 2 Carrot, 5 inch Bottle Gourd, 2 handful of Baby-Spinach, 3 inch Ginger. Water content should be enough to sub-merge all vegetables. Chop and mix all with water. We are using pressure cooker to boil. Add all vegetables to cooker. Close the cooker lid. Switch ON the stove on high flame and let it make a whistle. After 1 whistle, switch OFF the stove. Let the steam vanish on its own before you try to open the cooker lid. Once the steam has gone, open the lid and take out the boiled veggies in a bowl. Seasoning: Sprinkle 2 pinch Salt, 2 pinch black pepper and 1 tsp lemon juice. The soup is ready to serve. This is good for at-least 2 meals for the day. I am planning to eat it in breakfast and Lunch. 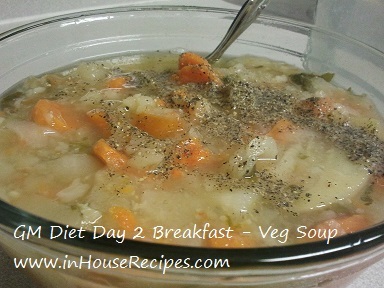 1 medium size bowl of Veg Soup. I am again feeling a bit of headache. Craving for food is very low as compared to day 1. I am drinking water as and when I am feeling some hunger. 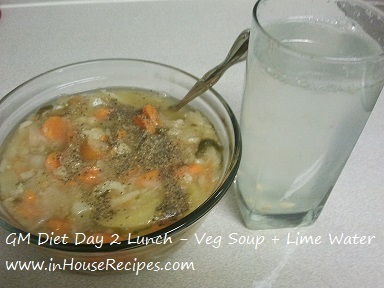 1 med size bowl of veg soup with a glass of lime water (no salt and no sugar). 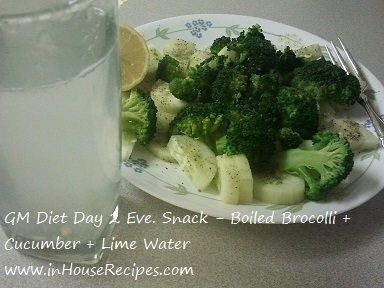 1 small bowl boiled Broccoli, 1 Cucumber with seasoning of 1/2 tsp Black pepper, 1/2 tsp Black Salt and 1/2 tsp lemon juice. Headache has lowed down. I guess my body has now got used to the diet. 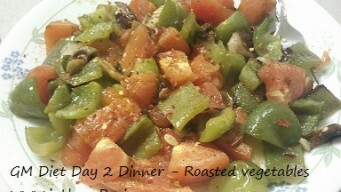 1/2 capsicum, 1 tomato, 5 mushrooms – roasted in oven with 1 tsp of Oil. Roast them for about 15 minutes. You can even saute them using a pan if you don’t have Oven. Mild stair climbing coupled with a small walk. No hard exercises. 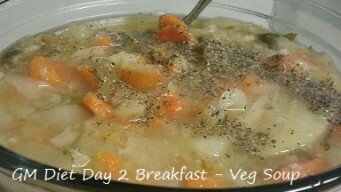 Its the end of GM diet day 2 and I can still feel a bit of headache at the back side. But the intensity is much less than day 1. One more observation is that the urine has gone colorless. This is the sign of diet working on the right path. Going to hit bed now.